Anyway, this is a fair James Bond film. There are some things I do like about it, but it is by far Daniel Craig’s weakest turn as 007. The positives: Craig is really coming into his own as Bond. He’s suave and debonair, and while he may not seem as intelligent as other Bond’s he still has some of the trademark dry wit. I also like that the story moves away from Bond’s romantic relationships and focuses more on his relationship with Mi6 head, M. Watching Craig and Judi Dench match wits and verbally spar are some of the highlights of the latest three 007 films. However, the biggest problem with Quantum is that it’s really boring. Casino Royale signaled that the series was headed in a grittier, more realistic direction, but Quantum is just too realistic to the point where it’s hardly fun. The story revolves around a shady organization that at first glance seems to be protecting oil interests, but are instead attempting to control the flow of water in a desert. On the one hand, it’s a good idea. Everyone is worried about peak oil, but few people really give any thought to the fact that the world is quickly running out of clean water. But then, I don’t go to a James Bond movie to be reminded of real problems. I go to be entertained, and this film is not entertaining enough. I was able to forgive the fact that Casino Royale did not feel at all like a James Bond film because it was such a damn good movie. 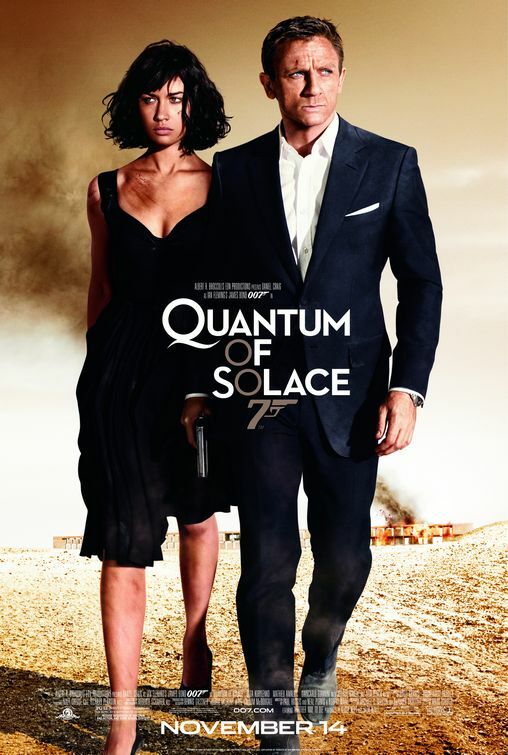 Quantum of Solace does not contain the string story so it is a lot less entertaining, and still does not feel like a Bond film. Daniel Craig returns for his second outing as the MI6 super spy, still in his early days. Bond is recovering from his betrayal at the end of the last film and determined to discover who was behind the events that occurred in Casino Royale. His quest for revenge eventually leads him to Dominic Greene (Mathieu Amalric), a wealthy businessman looking to orchestrate a coup in Bolivia, while also buying up all of their most precious resource, water, and planning to sell it back to the dictator he will help put into power. Helping Bond is Camille Montes (Olga Kurylenko), who is also out for her own revenge. Bond uncovers a secret organisation named Quantum, that seem to be behind much of Bond’s recent grief. Can he uncover the secrets behind this secret company? As with the first Daniel Craig Bond film, Quantum of Solace feels more like a Jason Bourne film than any previous Bond adventure. Daniel Craig is still prickly as James Bond, not yet oozing charisma like many of his predecessors did. My biggest problems with this film are really only small things. Daniel Craig does not say “Bond… James Bond” once, he still has no gadgets, and he only sleeps with one woman throughout the whole film. This is not the Bond I remember. When you take away everything that makes James Bond and give him an ordinary story, you are left with not much more than a generic action movie.